1) Scholarship money: it EXISTS. Even though McGill is going through some rough times financially, it is still possible to get full funding for graduate-level studies. This is wonderful. In addition, we have things like GREAT awards and In-Course funding for special circumstances. These things are luxuries, and would not be found everywhere. 3) Academic staff want you to succeed, and have the connections to actually pick up the phone to help you be able to succeed. All of my professors (and yes, I do mean ALL) have contributed in some major or minor way to my growth as a musician – and I feel honored to be connected to each one of them. My professors and teachers are highly connected to the music scene of 2011 and know what I will need to do to be able to contribute something of my own to the musical climate. Perhaps I am starting to feel nostalgic, as school is officially over for me and I am just waiting to graduate. However, McGill is an amazing place, and I want to encourage all of my colleagues who are waist-deep in thesis work and administrative loopholes to remember why you chose this institution in the first place. We are very lucky! 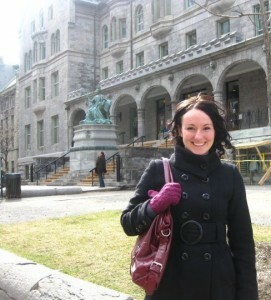 Published by rebecca on 2011/04/26 at 10:58 PM under Grad school experience, Montreal. Having spent a week in Montreal, visiting, and feeling a little (and happily) as den mom at McGill…I have been thrilled with the professional level of performance! Doubly impressed with the encouragement from McGill staff, the honest critique, support and critique from fellow students. As a parent…I would argue that every penny spent is worth at least $1000.00. Rebecca…I think you’ve been in the best place for you….so far!